Phaser 7400 selges ikke lenger som nytt produkt. Phaser 7400DNZ SRA3-format LED-skriver med farger: 220V strømforsyning, 512 MB + 20 GB intern harddisk, 36 SPM i farger / 40 SPM isort/hvitt, 1200 ppt, 10/100 BaseTX Ethernet, USB 2.0, 800 MHz prosessor, automatisk tosidig utskrift. 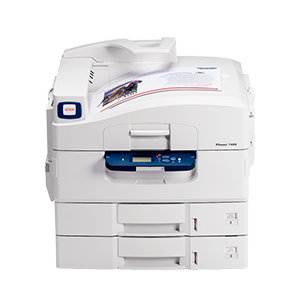 "If you're talking about a color laser printer that can handle tabloid-size (and larger) output and crank it out faster than any printer on the market, then the Xerox Phaser 7400N ($3,000 street) could be considered a bargain for small to medium-size businesses." 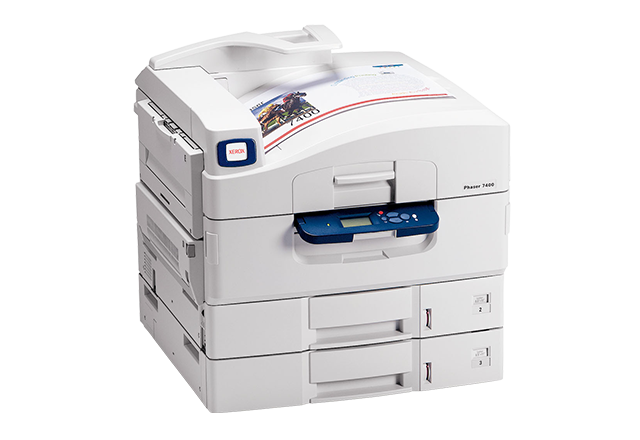 The Xerox Phaser 7400 family has been selected as a Editor's Choice winner in Better Buys for Business 2006 Color Laser Printer & Business Ink Jet Printer Guide. "These ledger-size models produce color pages with excellent speed. In addition, they add a number of productivity-enhancing features that make them even more useful in office environments. 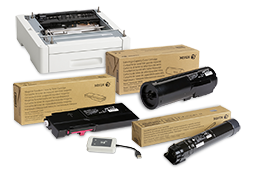 If you need a rugged business printer, the Phaser 7400 family is a smart choice."